Torah has all the science in it! Einsteins loss. Nice story 2. This is just an article and not the first chapter of a book so I will be short and to the point. I have mentioned many times before, everything science discovers is no more, than principles already in place by G-d The Creator of this universe, and reflected in the blueprint G-d Himself referred to, when creating this world. Everything in this world, has its roots and principles already expressed in the wisdom, and rules, of our Torah, and the practices, of our Tzadikim – Spiritual giants. Quantum entanglement is an area of extremely active research by the physics community, and its effects have been demonstrated experimentally with photons, neutrinos, electrons, molecules the size of buckyballs, and even small diamonds. Research is also focused on the utilization of entanglement effects in communication and computation. 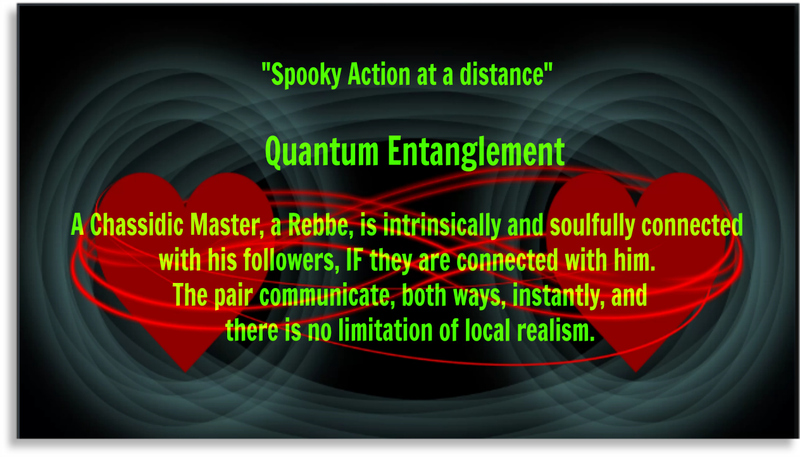 Quantum entanglement is a quantum mechanical phenomenon in which the quantum states of two or more objects have to be described with reference to each other, even though the individual objects may be – and here is a key word - spatially separated. This leads to correlations between observable physical properties of the systems. For example, it is possible to prepare two particles in a single quantum state such that when one is observed to be spin-up, the other one will always be observed to be spin-down and vice versa, this despite the fact that it is impossible to predict, according to quantum mechanics, which set of measurements will be observed. As a result, measurements performed on one system seem to be -- instantaneously -- influencing other systems entangled with it. At the same time, it prompts some of the more philosophically oriented discussions concerning quantum theory. The correlations predicted by quantum mechanics, and observed in experiment; reject the principle of local realism, which is that information about the state of a system should only be mediated by interactions in its immediate surroundings. Different views of what is actually occurring in the process of quantum entanglement can be related to different interpretations of quantum mechanics. In the case of entangled particles, such a measurement will be on the entangled system as a whole. It thus appears that one particle of an entangled pair "knows" what measurement has been performed on the other, and with what outcome, even though there is no known means for such information to be communicated between the particles, which at the time of measurement may be separated by arbitrarily large distances. 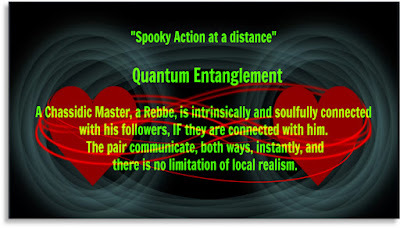 Einstein referred to it as "spooky action at a distance”, that’s because he wasn’t a Torah observant Jew! This has been shown to occur even when the measurements are performed more quickly than light could travel between the sites of measurement. Recent experiments have measured entangled particles within less than one hundredth of a percent of the travel time of light between them. ….. Movable property can be acquired without meshichah (dragging) in the following situation. Reuven sold movable property to Shimon for 50 zuz. Shimon acquired the movable property and obligated himself to pay Reuven the price agreed upon. After Shimon became obligated to Reuven for these 50 zuz, he desired to sell wine, an animal, a servant or other similar movable property. Reuven told him: "Sell that object to me for the 50 zuz that you owe me for the sale," and Shimon agreed. Here you have one classic example in Jewish Law where the act of a person, after entanglement, is able to affect an object no matter where it is found, instantly, with a change and transfer in ownership, with all the legal and spiritual ramifications and ripple effects this brings about. Here is one story of many, on this subject. A Chassidic Master, a Rebbe, is intrinsically and soulfully connected with his followers, IF they are connected with him. The pair communicate, both ways, instantly, and there is no limitation of local realism. My Chassidic teacher Rabbi Mendel Futerfas was sent to the Siberian gulag for 15 years. On his birthday, he had a very strong intense yearning to receive a blessing from the Rebbe. In the gulag he imagined himself entering the Private room of the Rebbe and approaching the Rebbe with a request for a blessing. His wife in Paris received a response and good wishes. It was only years later when he was finally liberated from that hell, and re-connected with his wife, when this matter came up for conversation they put two and two together. There is a beautiful lullaby we sing to the children in Yiddish and it ends with, “Torah is the best merchandise – Torah IS the BEST merchandise.” BTW - Beats singing a Brittany Spears or any other garbage song, into the pure innocent penetrable souls. 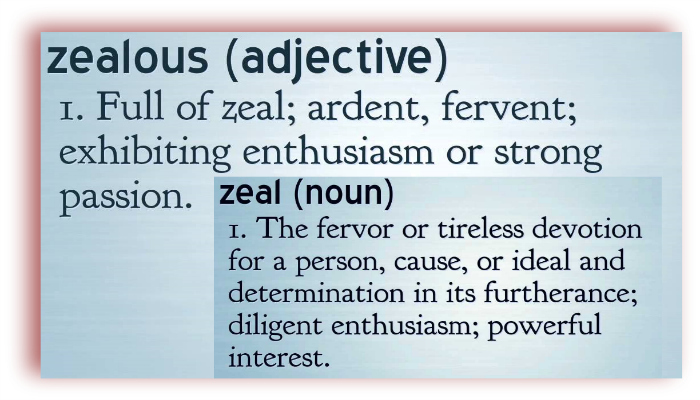 Zealousness. You receive what you put out. “Not only the tribe of Levi, but any one of the inhabitants of the world whose spirit generously motivates him and he understands with his wisdom to set himself aside and stand before God to serve Him and minister to Him and to know God, proceeding justly as God made him, removing from his neck the yoke of the many reckonings which people seek, he is sanctified as holy of holies. God will be His portion and heritage forever and will provide what is sufficient for him in this world like He provides for the priests and the Levites. And thus David declared [Psalms 16:5]: "God is the lot of my portion; You are my cup, You support my lot." Maimonides Shemita chapt. 13 Hal. 13. In an earlier time, the Bible tells us a story of Pinchas, the grandson of Aaron the high priest, who took matters in his own hands. He witnessed the public desecration of the law, when he saw the leader of the tribe of Shimon carry on in a romantic relationship with a Midianite princess, and killed both of them. As a reward for taking this action, and stopping the plague that was going on, G-d rewarded Pinchas by making him and his progeny Priests, forever. In fact all the priests who served in the Temple in Jerusalem where his descendants! The same question is asked here. It is only if ones father is a priest can a child be a Priest. If the priesthood is totally dependent on the father one has, and it is a matter of a natural reality, once Pinchas was not a priest, how was he able to become one? The answer lies in the type of behavior Pinchas projected to earn this reward. Most people who serve G-d with self –sacrifice do so as an anomaly. 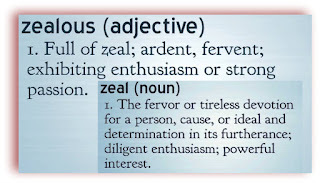 For the most part they will use their minds, things are measured, and it is only in the exceptional moment they will act beyond the call of duty and give it all they are, and all they have. There are others, perhaps very few, who have no personal desires outside their life calling. Their lives, the essence of their being is entirely dedicated to G-d and every detail in their lives are directed in that path. This was the life of Pinchas. He endangered his own life to do something he was not asked or expected to do. If he were to ask a Rabbi how he should act in this situation, he would not have been told to do what he did. The moment was calling “him” to act, to totally lunge himself entirely for the cause, for the great desecration of G-ds name at the time. He was zealous for the jealousy of G-d. Since he acted in a way that was totally beyond his duty, and/or anything expected of him, he was treated by G-d in a way that is normally not the way of G-d and of the world. He received the reward of Priesthood for him and his children forever. When any person so dedicates himself and his resources for a holy purpose, even to the point that it goes beyond logical rational thinking, it’s a calling to his essence and of his essence, G-d responds in kind with His essence, to whatever person it may be, and becomes this persons inheritance. G-d personally, provides for this individual.